Description: First segment somewhat rough, without spines externally, without strictures along AL and I'. Apical horn approximately equal to height of first segment. Ventral horn shorter than apical horn. Pores in first segment very small, circular and distributed in only its lower part. 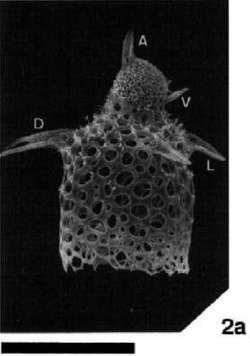 Second segment subdivided into a conical upper part, with numerous fine spines, and a cylindrical lower part, without spines, by an indistinct shoulder, where three feet are extending. Three feet stout, straight and three-bladed, extending free from the lower part of thoracic wall. Pores in second segment circular to subcircular, larger than those in first segment with indistinct longitudinal hexagonal pore frames. Distal aperture of second segment wide opened, without distinct rim or teeth. Appendages of internal spicule composed of ar, al, pd, pv, jr, jl, cr and c|. pd on left L, and pv on right L which is slightly directed upward. Connecting arches composed of AL (arpv and alpd). LV (pvjr and pvjl) and DL (crpd and clpd). Two DL indistinct with some specimens. Right and left I' distinct and extending toward the dorsal side along the shell wall. Internal spicule circular in cross section except for distal parts of A, V, D and two L (apical and ventral horns and three feet) which are three-bladed. V bending a little anticlockwise. Ax distinct on left L near at the junction with MB. Types: Holotype MW-125, OCUCR 0047. Paratype MW-125, OCUCR 0048. Remarks: Gondwanaria cylindrica n. sp. is distinguished from G. campanulaeformis by the distinct three feet, and from Gomisterna hospes Sugiyama by the absence of numerous solid spines on first segment and relatively large pores in second segment. Dimensions (in µm) (measurements based on 9 specimens): Maximum breadth of first segment: holotype - 45, range - 39-46 (average -43); maximum breadth of second segment (without feet): 100, 88-111 (100); height of first segment (without apical horn): 46, 37-46 (42); total height of shell (without apical horn and feel): 160, 132-206 (162). Etymology: The specific name is derived from the cylindrical shape of second segment. Occurrences: MW-125 and MW-118; Lower Miocene.